highQu qPCR mastermixes are based on the small molecular inhibitor technology Hot Start PCR allowing to achieve highest sensitivity and specificity under both standard and fast qPCR cycling conditions. They provide excellent results on both AT and GC rich templates and guaranty rapid extension with early Ct values with minimum or no optimisation. Our mastermixes are supplied with PCR Water to guaranty the best performance. 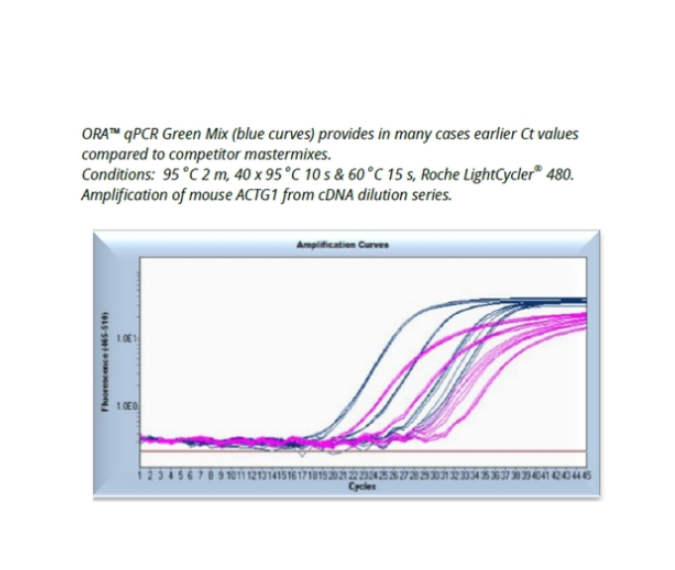 To suit the broad instrument range the ORA qPCR Green Mastermixes are available in different versions –with low or high ROX concentration. Dye based qPCR on instruments calibrated with low or high ROX concentration available. Use special primer selection programs for good planning. Work with amplicons in a range of 80-200, max 400 bp. Take typical measures to prevent PCR cross over contamination, keep your bench clean, wear gloves, use sterile tubes and filter pipet tips. Run reactions in triplets; include a no-template control and positive control in parallel. Thaw and keep reagents on ice. Mix well before use. Reverse Primer 100 – 400 nM final c.
Forward Primer 100 – 400 nM final c.